Pseudolarix amabilis is commonly known as the Golden Larch, although it is not a true larch. It is native to eastern China, growing in small areas in the southern and eastern mountains to heights of over 100 feet. The Golden Larch is also known under an older Latin name: Pseudolarix kaempferi, and is a deciduous tree with long shoots and short shoots that grow similar to a larch; but unlike the larch family, it is quite tolerant of summer heat and humidity and can grow where most larches and firs are unable to thrive. The Golden Larch is a favorite low maintenance tree for bonsai growers for its beautiful fall color and hearty habit. With proper care, and attention to its undemanding, but specific needs, it will be a beautiful addition to any bonsai garden. The small leaves of the Golden Larch are bright green, and turn a brilliant golden yellow shade before falling in the autumn; the leaves are arranged spirally, widely spaced on long shoots, and in a dense whorl on the short shoots. Reddish brown bark is found on younger trees turning grayish brown with some ridge and furrowing as the tree ages. Golden Larch is said to be one of the best deciduous conifers for autumn color. The Golden Larch also has small purple-green cones that turn golden brown in the fall. When weather is severe in the winter, the Golden Larch demands protection. This bonsai will produce shorter, more compact needles in cooler climates, and in hot and humid conditions, their needles will be longer. The golden larch handles humid heat well; this being said, it does very well outdoors during the warmer months, but also does well indoors if provided with enough humidity to combat the dry conditions found indoors in the winter. However, it is desirable to let the tree overwinter with ample protection in a frost free protected location such as a cold frame or storage shed. This bonsai will enjoy being positioned where it can receive ample morning sun and afternoon shade, or dappled shade all day. In order to prevent leave scorch, you will need to protect your Golden Larch bonsai in the summer by placing them in the shade of a larger tree. Larches love water and the Golden Larch is no exception, even though it is not really a Larch. 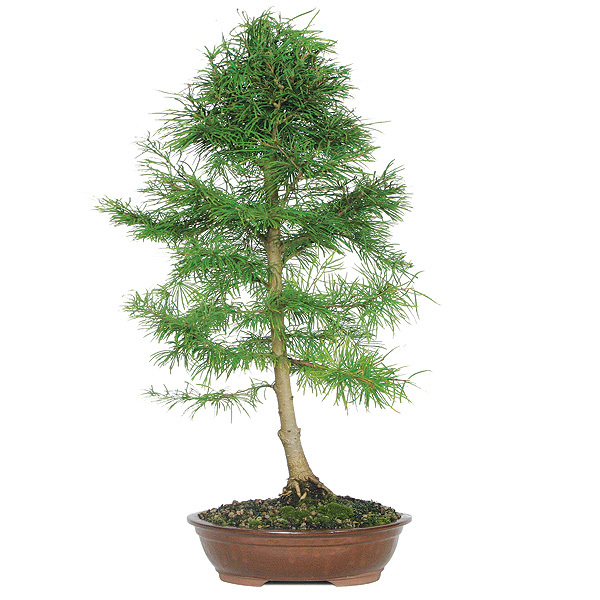 They are the perfect conifer for those who find watering an enjoyable occupation. Be sure to keep this bonsai evenly moist, watering every day from April through October, and two times a day during the heat of summer to ensure that it doesn’t dry out. This bonsai will benefit from a humidity tray filled with stones so that the roots will benefit from needed moisture without suffering from being waterlogged which can lead to root rot. Your Golden Larch is not drought tolerant, so if travel is of necessity, be sure to make arrangements for bonsai care while you are away. Between April 1 and mid-July, you will want to fertilize this young and vigorous specimen about four times a month with a mild liquid organic fertilizer diluted to one-fourth the recommended strength. Starting in late summer, you will want to use a low-nitrogen fertilizer to strengthen the tree for the coming winter. The Golden Larch should be pruned in the spring when its leaf buds are ready to sprout and the bare branches can still be seen taking great care to avoid knocking off the new buds. The branches of this bonsai will thicken rapidly and wire should be inspected regularly to ensure it is not damaging the bark. Old branches can be successfully wired as long as protection with raffia is provided to avoid marking the rough bark. This bonsai tends to be quite flexible and takes to wiring easily and are beautiful in all forms of bonsai except the broom style. This bonsai is quite hearty and is resistant to most pests and diseases, though it can succumb to aphids and scale if under stress. To deal with aphids, a simple mixture of 1 tsp dish soap to 1 quart warm water sprayed over the entire plant until desired runoff is achieved is very effective at removing this pest. Be sure to rinse the solution well with tepid water and repeat as needed. Scale can be removed manually with a sharp knife or dabbed with a swab or ball of cotton dipped in isopropyl (rubbing) alcohol. Do not use other alcohols, such as ethanol or methanol, because they penetrate the plant tissues rapidly and will cause considerable damage to soft tissues! After treatment, be sure to remove all scales by hand, large and small; allow the plant to dry and re-examine it for residual scale bodies. Repeat the alcohol wipe to remove all traces of the insects paying particular attention to the midrib, other veins, and leaf edge areas. Keep in mind that scale eggs are hidden under the waxy covering of the dead female, so if these are not thoroughly removed, the remaining eggs will hatch and continue the infestation cycle. Be sure to repeat treatment every 1-2 weeks until scale has been completely eradicated. Please be aware that a potentially rare problem that can occur with alcohol treatment is chilling of the plant tissues that can occur with the rapid evaporation of alcohol. This chilling is can cause over-cooling of the plant tissues, creating zones of dead cells that may become necrotic from bacteria or fungi. On warm or breezy days consider wiping any residual alcohol with a tissue instead of permitting it to evaporate off the plant. Sow seeds in early spring in moist soil. Air-layering is also successful and can be accomplished in late spring. To air layer, cut a small strip of bark away from the desired branch. Wrap the cut area with a small bag filled with moist sphagnum and peat- keep uniformly moist and wait about 6-12 weeks, at which time roots should begin to grow. Take the cutting once it has enough roots to live on its own in a new pot cutting just below the root ball and transplant into a container. Keep the peat/sphagnum mix around the roots when potting and enjoy your new bonsai. The Golden Larch doesn’t like having its roots cramped and will desire repotting every year in a basic soil mix with some ample organic matter. It is best transplanted at the end of February or early March, when the tips of the dormant buds begin to get shiny, which is just before their needles appear. The narrow planting window is this wonderful tree's only drawback and must be taken seriously. Golden Larch is used medicinally in holistic Bach flower remedies and is one of the 50 fundamental herbs used in Chinese herbology, where it is called jīn qián sōng. In Siberia young larch needles are harvested in spring, preserved by lactobacillus fermentation, and used for salads during winter.